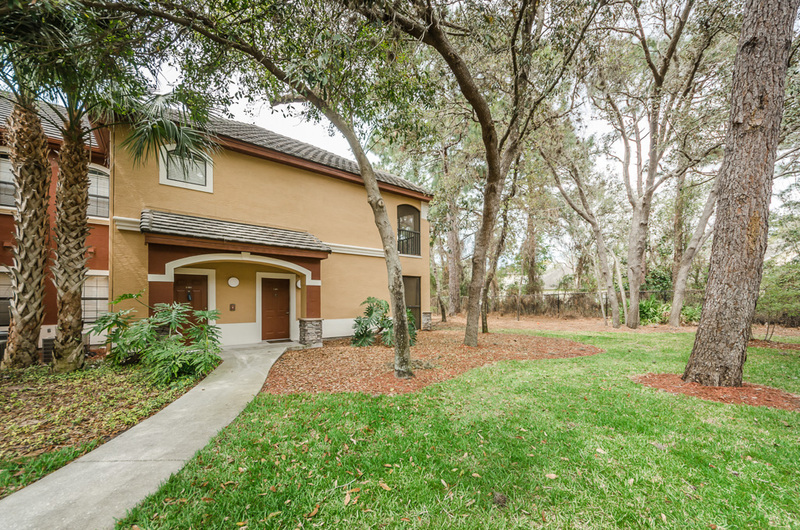 Steps from the world-famous Innisbrook Golf Club you will find the Tuscany-inspired, immaculately maintained grounds and stately wrought iron gates as the setting for this resort-style subdivision in Tampa Bay’s Palm Harbor. With controlled access entrance, you’ll be welcomed to a world unto itself. Besides a grand 8,460 SF clubhouse are two heated pools with sundecks and a heated whirlpool spa with waterfall. This grand hall boasts a fitness center/weight room with pool views, stunning private party room with kitchen, deluxe screening room with theater seating to view sporting events and movies, a lounge lit by a fireplace, and a billiards room. Surrounding this neighborhood’s hub is a playground with picnic area/BBQ grills, basketball/tennis courts, residents’ car wash, onsite trash compactor and a new recycle center. On the north side of this tranquil haven is this sunny end unit on the second floor with a screened patio overlooking the lush conservation. Plantation shutters on the sliders and windows frame the wide open floor plan embracing the kitchen, living room, and dining room dressed in Berber carpeting and crown molding. The adjacent windowed laundry room includes a storage closet to complement the kitchen’s pantry and a built-in desk. Both large bedrooms have walk-in closets and full baths with tubs. On-site security and community association personnel ensure care of the common areas, while the HOA fees include all on-site amenities, basic cable, pest control, and curbside trash pick-up. https://trinityeastlakerealestate.com/wp-content/uploads/2018/03/LC-WebLogo-340x156-300x138.png 0 0 loricrawford https://trinityeastlakerealestate.com/wp-content/uploads/2018/03/LC-WebLogo-340x156-300x138.png loricrawford2016-04-13 09:06:332016-04-13 09:06:33Innisbrook Picture Perfect Condo!